Lee Craigie the fastest woman around Etape Loch Ness joined by the fastest man around the course in 2016, James Davidson. 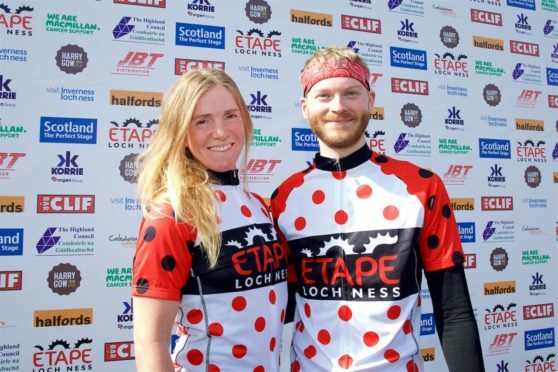 The fastest woman to cycle round the world and a Commonwealth mountain biker – who is pretty speedy herself – will share tales of their endurance adventures at a Loch Ness Etape event. Eden Court, which is used as the event hub over the weekend of April 27 and 28, will host an afternoon of film, storytelling and adventure as 5,600 riders prepare to saddle up for 66 miles of closed-road cycling. The venue will host a talk from Jenny Graham, who became the fastest woman to cycle around the globe, and show Commonwealth mountain biker Lee Craigie’s award-winning film on the epic Tour Divide. Both Jenny and Lee’s events will take place on Saturday 27 April.